The film won three Oscars for Best Art Direction, Best Score of a Musical Picture, and Best Sound Best Sound Mixing and was nominated for a further four Academy Awards, including Best Picture. Despite becoming one of the highest grossing films of 1969, it could not recoup its budget of $25 million (which adjusted for inflation is the equivalent of $164 million in contemporary dollars). Hello, Dolly! is now considered to be one of the greatest musical films ever. In 1890, all of New York City is excited because widowed, brassy Dolly Levi (Barbra Streisand) is in town ("Call On Dolly"). Dolly makes a living through matchmaking and numerous sidelines ("Just Leave Everything to Me"). She is currently seeking a wife for grumpy Horace Vandergelder (Walter Matthau), the well-known "half-a-millionaire", but it becomes clear that Dolly intends to marry Horace herself. Dolly travels to Yonkers, New York to visit Horace. Ambrose Kemper (Tommy Tune), a young artist, wants to marry Horace's weepy niece, Ermengarde (Joyce Ames), but Horace opposes this because Ambrose's vocation does not guarantee a steady living. Horace, who is the owner of Vandergelder's Hay and Feed, explains to his two clerks, Cornelius Hackl (Michael Crawford) and Barnaby Tucker (Danny Lockin), that he is going to get married because "It Takes a Woman" to cheerfully do all the household chores. He plans to travel to New York City to propose to Irene Molloy (Marianne McAndrew), who owns a hat shop there. Dolly arrives in Yonkers and sends Horace ahead to the city. Before leaving he tells Cornelius and Barnaby to mind the store. Cornelius decides that he and Barnaby need to get out of Yonkers. Dolly knows two ladies in New York they should call on: Irene Molloy and her shop assistant, Minnie Fay (E. J. Peaker). She enters Ermengarde and Ambrose in the upcoming polka competition at the fancy Harmonia Gardens Restaurant in New York City, so Ambrose can demonstrate his ability to be a bread winner to Uncle Horace. Cornelius, Barnaby, Ambrose, Ermengarde and Dolly take the train to New York ("Put on Your Sunday Clothes"). Irene and Minnie open their hat shop for the afternoon. Irene does not love Horace Vandergelder and declares that she will wear an elaborate hat to impress a gentleman ("Ribbons Down My Back"). Cornelius and Barnaby arrive at the shop and pretend to be rich. Horace and Dolly arrive and Cornelius and Barnaby hide. Minnie screams when she finds Cornelius hiding in an armoire. Horace is about to open the armoire himself, but Dolly "searches" it and pronounces it empty. After hearing Cornelius sneeze, Horace storms out upon realizing there are men hiding in the shop, although he is unaware that they are his clerks. Dolly arranges for Cornelius and Barnaby, who are still pretending to be rich, to take the ladies out to dinner to the Harmonia Gardens to make up for their humiliation. She teaches Cornelius and Barnaby how to dance since they always have dancing at such establishments ("Dancing"). The clerks and the ladies go to watch the Fourteenth Street Association Parade together. Alone, Dolly asks her first husband Ephram's permission to marry Horace, requesting a sign. She resolves to move on with life ("Before the Parade Passes By"). After meeting an old friend, Gussie Granger (Judy Knaiz), on a float in the parade, Dolly catches up with the annoyed Vandergelder as he is marching in the parade. She tells him the heiress Ernestina Semple (changed from the stage version's Ernestina Money; also Judy Knaiz) would be perfect for him and asks him to meet her at the Harmonia Gardens that evening. Cornelius, Barnaby and their dates arrive and are unaware that Horace is also at the restaurant. Dolly makes her triumphant return to the Harmonia Gardens and is greeted in style by the staff ("Hello, Dolly!"). She sits in the now-empty seat at Horace's table and proceeds to tell him that no matter what he says, she will not marry him. Fearful of being caught, Cornelius confesses to the ladies that he and Barnaby have no money, and Irene, who knew they were pretending all along, offers to pay for the meal. She then realizes that she left her handbag with all her money in it at home. The four try to sneak out during the polka contest, but Horace recognizes them and also spots Ermengarde and Ambrose. In the ensuing confrontation, Vandergelder fires Cornelius and Barnaby (although they claim to have already quit) and they are forced to flee as a riot breaks out. Cornelius professes his love for Irene because "It Only Takes a Moment". Horace declares that he wouldn't marry Dolly if she were the last woman in the world. Dolly angrily bids him farewell; while he's bored and lonely, she'll be living the high life ("So Long, Dearie"). The next morning, back at the hay and feed store, Cornelius and Irene, Barnaby and Minnie, and Ambrose and Ermengarde each come to collect the money Vandergelder owes them. Chastened, he finally admits that he needs Dolly in his life, but she is unsure about the marriage until Ephram sends her a sign. Vandergelder spontaneously repeats a saying of Ephram's: "Money, pardon the expression, is like manure. It's not worth a thing unless it's spread about, encouraging young things to grow." Cornelius becomes Horace's business partner at the store, and Barnaby fills in Cornelius' old position. Horace tells Dolly life would be dull without her, and she promises that she'll "never go away again" ("Finale"). The film premiered in New York at Rivoli Theater on December 16, 1969 and at Grauman's Chinese Theatre in Los Angeles on December 19. Production had wrapped more than a year earlier, but release was significantly delayed for legal reasons. A clause in the 1965 film sale contract specified that the film could not be released until June 1971 or when the show closed on Broadway, whichever came first. In 1969, the show was still running. Eager to release the film to recoup its cost, Fox negotiated and paid an "early release" escape payment to release the film "Dolly" at an estimated $1–2 million. Vincent Canby in his New York Times review said that the producer and director "merely inflated the faults to elephantine proportions." The film grossed $33.2 million at the box office in the United States, earning a theatrical rental (the distributor's share of the box office after deducting the exhibitor's cut) of $15.2 million, ranking it in the top five highest-grossing films of the 1969–1970 season. In total, it earned $26 million in theatrical rentals for Fox, against its $25.335 million production budget. Despite performing well at the box office, it still lost its backers an estimated $10 million. Songs as well as footage from scenes "Put on Your Sunday Clothes" and "It Only Takes a Moment", were prominently featured in the 2008 Disney-Pixar film, WALL-E. WALL-E watches the footage from an old iPod, and learns about the concept of love from the film. ↑ "100 Greatest Film Musicals". Retrieved 2015-12-07. ↑ "The Best Movie Musicals of All Time". Retrieved 2015-12-07. ↑ "The Top 100 Greatest Movie Musicals of All Time". Retrieved 2015-12-07. 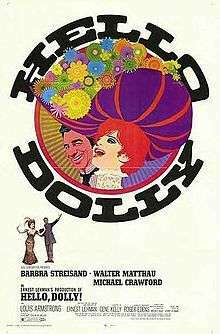 ↑ "Hello, Dolly!". IMDb. IMDb.com, Inc. Retrieved 27 November 2013. ↑ Kurtti, Jeff (1996). The Great Hollywood Musical Trivia Book. New York: Applause Books. pp. 143–166. ISBN 1-55783-222-6. ↑ Canby, Vincent (December 18, 1969). "'Hello, Dolly!' (1969): On Screen, Barbra Streisand Displays a Detached Cool". The New York Times. Retrieved March 9, 2010. 1 2 "Box Office Information for Hello, Dolly!". The Numbers. Nash Information Services. Archived from the original on October 18, 2012. Retrieved February 26, 2012. ↑ Cones, John W. (1997). The feature film distribution deal: a critical analysis of the single most important film industry agreement. Southern Illinois University Press. p. 41. ISBN 978-0-8093-2082-0. ↑ "Box Office Tracking By Time – Key Terminology: Gross". Box office Mojo. Retrieved September 21, 2013. 1 2 Williams, Linda Ruth; Hammond, Michael (2006). Contemporary American Cinema. McGraw-Hill. p. 176. ISBN 9780335218318. ↑ Krämer, Peter (2005). The new Hollywood: from Bonnie and Clyde to Star Wars. Wallflower Press. p. 44. ISBN 9781904764588. 1 2 LoBianco, Lorraine. "Hello, Dolly! (1969) – Articles". TCM database. Turner Classic Movies. Retrieved April 7, 2013. ↑ "Hello, Dolly!". The New York Times. Retrieved December 27, 2008. ↑ "BAFTA Awards (1970)". British Academy of Film and Television Arts. Retrieved November 23, 2013.